The Keeneston Roses is a wonderful story about the lives of the Rose Sisters, triplets from Keeneston, KY. It starts from their early years and goes through to current times. We witness each of their heartbreaks, as each have their hearts broken by men who didn’t deserve them. We see Lily, who had already experienced her heartbreak at a young age, finds herself the only daughter left at home. She begins playing the town’s matchmaker which brings her happiness to give to others what she can’t have herself. When Daisy experiences her heartbreak, we see how the famous Rose Sisters’ Iced Tea was created. Violet returns home after heartbreak and finds comfort matchmaking with her sisters and cooking southern comfort foods. 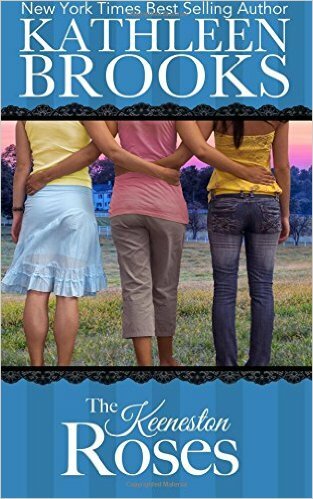 When the sisters are young adults, a tornado rips through town and their parents are killed. This prompts the sisters to open the now famous Blossom Café, with Violet as the cook and Daisy running the business side. Lily turns the family home into the town’s B&B. The Rose sisters have been a big part of every book in the Bluegrass series. We never had the background on why they never married, or how they lived their lives. Their matchmaking is legendary as is their knowledge of all the going on around town. While their lives certainly didn’t turn out the way they envisioned, they each eventually come to terms with it. Ultimately, we get to see each Rose sister get their own happily ever after’s- and celebrate together. I’m so glad that their book was written. The ending of the book gives us a glimpse into the lives of the next generation of Keeneston and it seems there are some up and coming matchmakers already practicing. All past characters are woven in the storyline without distractions and we are updated on their current lives. Beautifully written with emotion and humor. What a special tribute to the sisters who are the heart & soul of Keeneston. Fans of the series will not be disappointed.